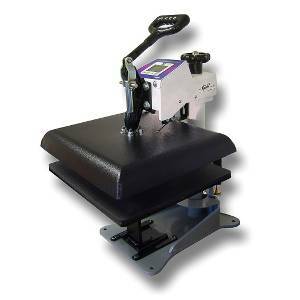 The Digital Combo multipurpose swing-away heat press is available as a manual or air operated machine. This fully digital swing-away press boasts all of the digital features of our state-of-the-art control system. This includes Digital Temperature, Time, and a Digital Pressure/ Height gauge, as well as programmable presets, user definable alarms and a host of other digital features. The construction is a solid steel welded framework, the press features SuperCoil-Microwinding heater technology, and carries the same warranties as the Digital Knight line of presses. The popular success of the Digital Combo lies in its instantly interchangeable system of heat platens and bottom tables. The heat platens can be safely swapped while hot, and the lower pedestals tables can accommodate any possible material challenge. The Digital Combo press is able to press items over 1inch thick, and can be adapted for far thicker products with customized pedestals.